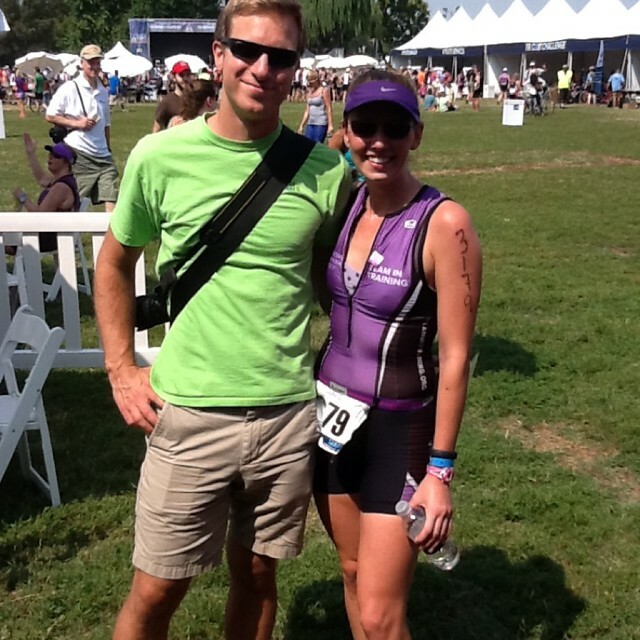 I am still on such a high from The Nation's Triathlon this past weekend! First of all, Team in Training was one of the best experiences of my life! And, I don't even feel as if I took advantage of the whole experience. I could have done more and gotten more out of it, yet, it was still amazing! Why, you ask? I think it's knowing that not only are you going to compete (or participate - but you know I'm a competitor!) in a challenging physical activity, but you're also doing some good. The people who support me, as a person in my daily life all donated money to support an amazing organization, all those donations added up to a huge number ($100 over my goal of $2200), and thus, that organization supported me through my event. It's like a circle of giving! 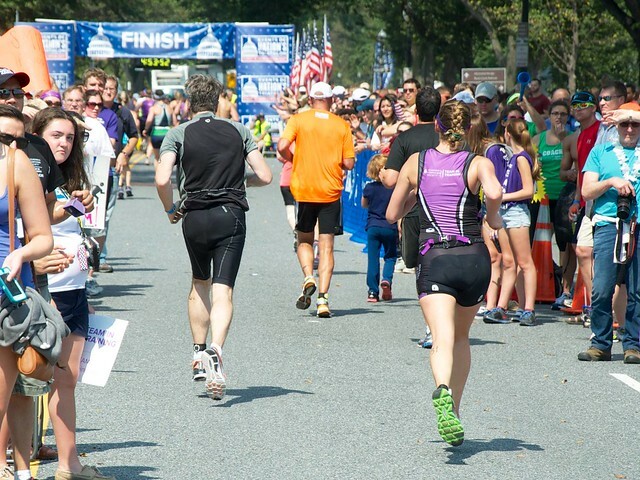 And because I flaked on workouts, and was really only focused on the fundraising part of TNT, I didn't quite understand the whole picture until after I crossed the finish line. The night before the race I went to the TNT inspiration dinner and walked down the stairs to a line of TNT coaches and staff, hooting and hollering, ringing bells, using noise makers, and just cheering up a storm for all of the athletes. It was even more crazy/loud/supportive/happy than an MK event (if you know, you know - and you know that's hard to beat)! The dinner was exactly what it was supposed to be: absolutely inspiring! I almost can't go into detail about it, because I'm not sure my recount would do it the justice it deserves. I laughed, I cried, and I felt proud to be part of all of it. But I was still nervous about the next morning. During packet pick up, I told Reid I felt a sense of impending doom. He told me to sing "the doom song" and that helped me laugh off that feeling, but I really have never had nerves like this before an event. I worried that I wouldn't be able to finish. Probably because I knew I didn't put the same level of training in as everyone else around me... I literally did 3 swim practices (one pool and two open water), 4 bike rides (2 with the team), and a minimal (not just for me, but for a normal person) amount of running. Reid thinks I was having training amnesia, only thinking about the week before the race, but I looked at my training log - I would literally have to rely on base fitness to get through this tri! And I was actually scared that I would drown on the swim course or crash badly on my bike. Luckily, I am pretty good at pushing my fears aside, taking control, and doing what needs to be done. 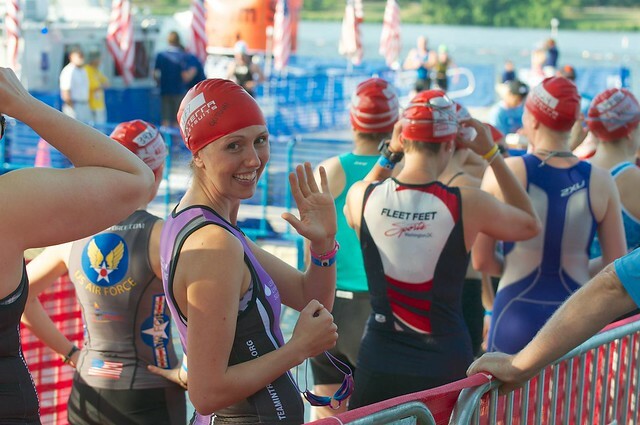 By the time I got into the corral for the swim, I actually looked pretty calm and happy! Reid and I got up at 4am. I stressed out a bit, got dressed, packed up the rest of my stuff, and Reid took Penny on a walk. We then left Reston only to get half way down the toll road when I realize that I had forgotten my water bottles for the bike. So we went back home, then hit the road again, and finally made it to transition around 5:40am. I am a freak, and like to be one of the first people at races, even though I know it means waiting. 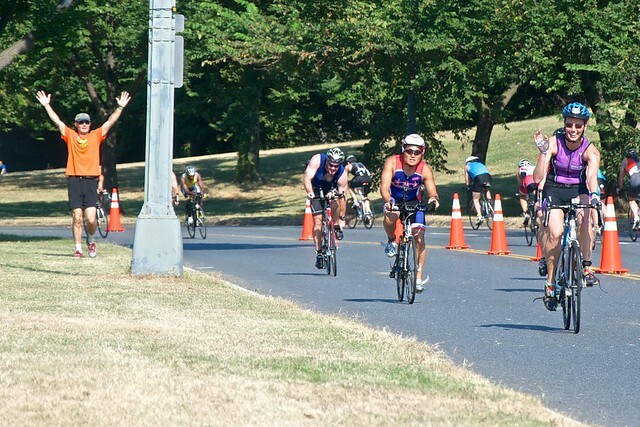 What I learned about triathlons is that no matter if you're early or late, there's plenty of time to wait! 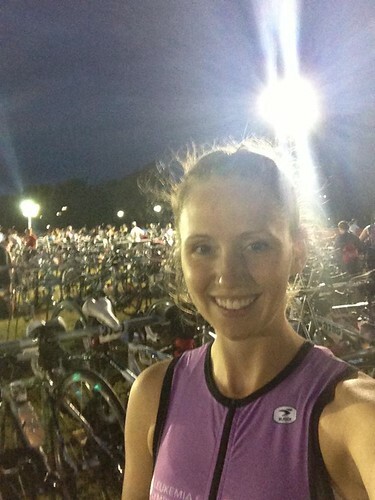 Then I headed into transition, set up my area, took a selfie, and prepared myself for the upcoming race. I had packed the wetsuit that my Grannie paid for as support for me, but it ended up being 79.6 degrees, not wetsuit legal, so it stayed in my bag. I also packed a change of clothes, a towel, a headlamp (which I didn't need because I was by a light, but I don't regret bringing), and extra goggles. The only thing that I didn't need, surprisingly, was the towel. (oh, and Amanda - the towel you gave me finally made it to my blog!!) But I feel like I got some good race karma for the day because I lent a pair of goggles to the girl next to me who had forgotten hers. Then I left transition to wait. Luckily, I had Reid and my parents to wait with! 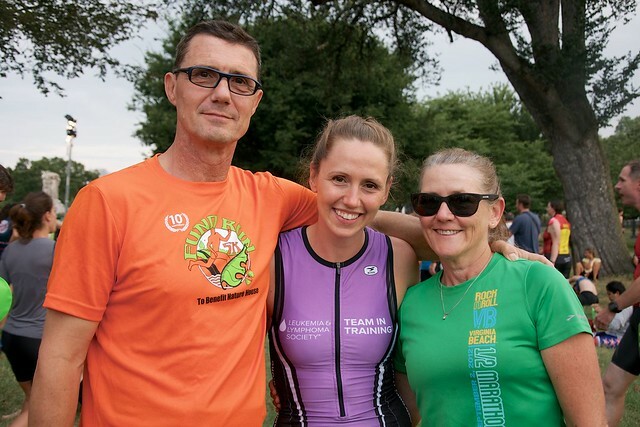 It was so cool that my parents came down to see my first triathlon! I regret telling them not to come to things when I was a kid, because they actually listened to me! So I think it's really nice that they are super supportive now! Transition closed at 6:55am and the first waves went into the swim around 7am. I was in wave 28, so I figured I would be swimming around 8:30am. I was off by about a half an hour and didn't end up getting into the water until around 9am. 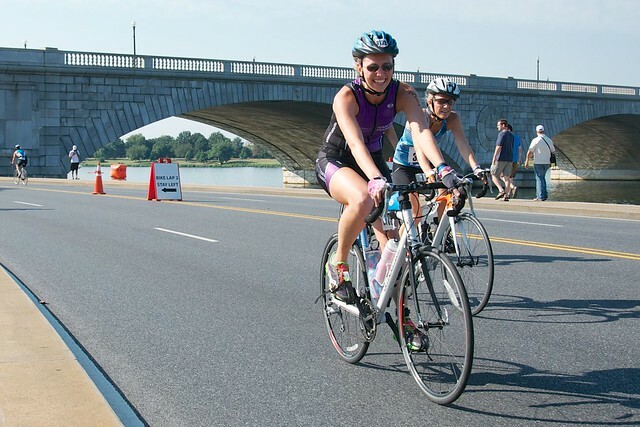 Even though I didn't spend a lot of time training for this tri, I did read a couple of tips. One of them was to wear tinted goggles when it was sunny, which I do in the outdoor pool, so I did during the race. It was a mistake. First of all, my "light" goggles are still tinted. They're pink tinted with a mirror finish. I had been using them during late afternoon open water swims, and they were great because I could still sight with them a little foggy. With the dark ones that I choose to wear on race day, I was having trouble sighting through the fog... so I kept slowing down to clear them... I felt like a 5 year old with their first pair of goggles in a swim lesson. Lesson learned - lightly tinted goggles = the best of both worlds! 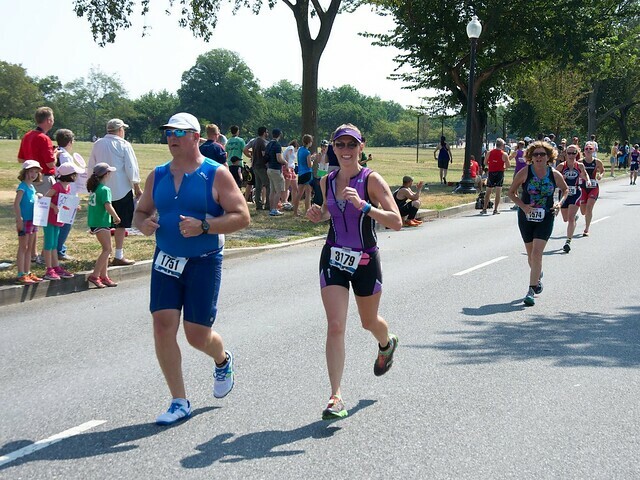 I was still nervous about swimming in my tri kit. I had only done it 2 other times with mixed results. 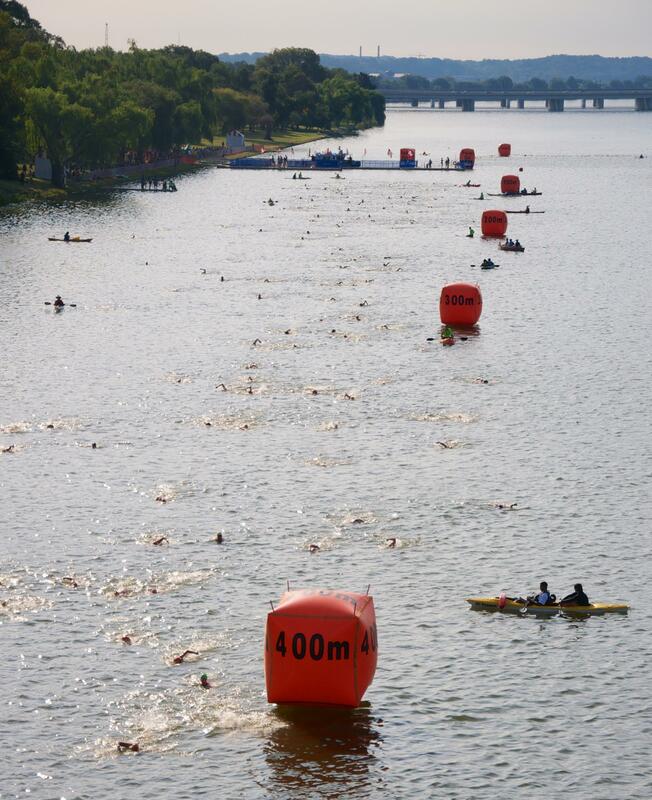 At the open water practice it felt painful, slow, and restrictive. I was a whiny baby about it actually. I did learn that if I hiked the shorts up like "boy shorts" it was more comfortable for my hamstrings, so I did that. The second swim I did with it was in a pool. There it just felt like drag, but not nearly as awful as the practice before. But now, looking back on the race, I can't tell you what my suit felt like in the water. I just remember the feeling of swimming. My only goal was to keep 2 min per 100m. I did that, for the most part, but slowed down almost to a stop a couple of times (okay like 10) to clear my goggles. When I finally started to pick up my speed, I realized it was too late. It was the last 200m of the race. Lesson learned - practice the swim and swim with a strategy in mind! There is one really cool thing that I did (for the first time) during the race. The day before I read about how to use corkscrew to swim the turns, so I did exactly that and it worked like I dream! 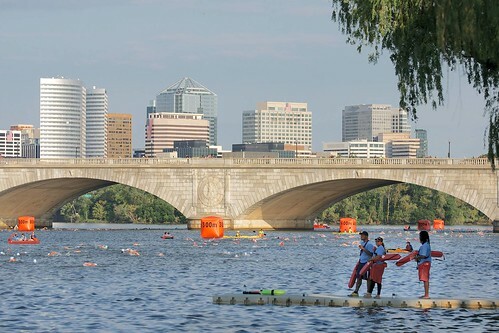 During my open water practices my turns felt slow and clumsy. But on race day, using the corkscrew turn, I felt in control of my direction and didn't feel like I had to slow down or stop to make the turns. I didn't set my watch when I started the swim, so I had no idea how long I had been in the water. I did know that I started in the middle of the red caps and finished with lots of different colored caps around me, so I took it as a good sign! My 3 swims, it seems, were just enough to get me through. Running from the swim up to transition was hard. I had really used my legs on the last part of the swim, so my steps were clumsy. I tried running, because everyone else was running, but it ended up being more of a gallopy-walk through transition to my bike. 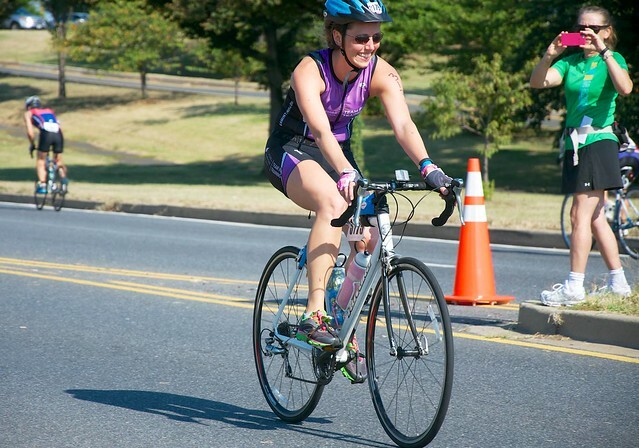 I tried to run to my bike, but after I got to it, got my shoes, helmet, and sunglasses on, I decided I'd rather have a slow transition than add time on the bike. So I took my time putting on my gloves and setting my runkeeper while walking my bike to the bike start. The strategy worked well for me. I was actually super happy that I had done my mini-tri with the Riso kids. It was the perfect way to practice transitions! (maybe not as funny as getting hosed down in the driveway like the kids did, but remember, I have neither a driveway or someone to hose me down!) 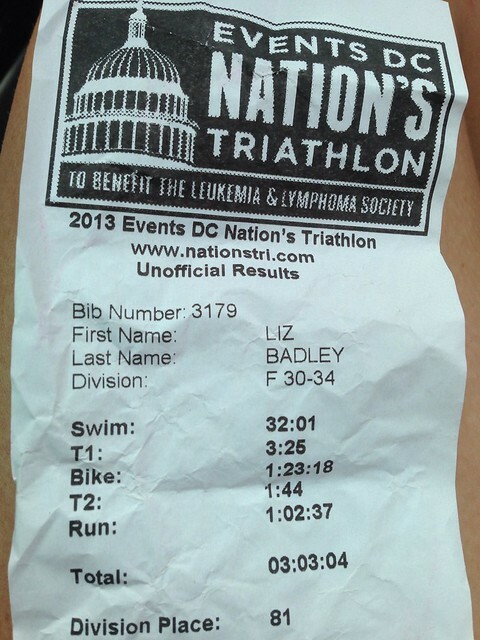 My 3 minutes and 25 seconds was a lot better than the 5 minutes I had planned on, and I was off on the bike leg! 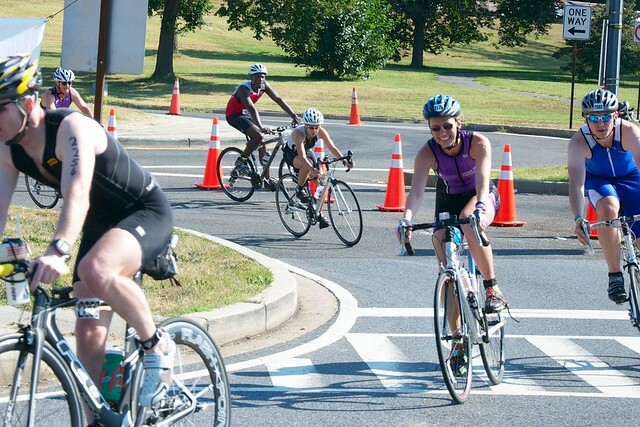 My only thought during the first part of the bike leg was "don't get a flat." I was really freaked out about having to change a tire on the course. My fears weren't helped by the fact that I saw no less than 6 people changing tubes within the first 5k! It wasn't until almost 10k into the bike that I saw my parents (who both made it into the background of photos that Reid took) and Reid. They were perfectly positioned so that I saw them at least 6 times over the bike leg. My dad was ahead of my mom and Reid, almost as a lookout, and would start jumping up and down and yelling "Go Lizzy!" while trying to run along side me. Then my mom would be yelling and cheering nearer to Reid, who was focused on getting these amazing pictures for me! I really had no clue what to do or what to expect on the bike leg, aside from worrying about getting a flat, I really didn't have enough experience on a bike to have a strategy, so I just rode. I got through most of the first loop and saw my parents and Reid again and realized I was halfway done with the bike portion. It all seemed to go by fairly quickly, but I had forgotten (again) to set my watch when I started, so I was going to have to wait for the end of the bike to get my time. But I did end up starting my watch on the second loop to get an idea. On the second loop, I knew what to expect, so I started pushing a little bit. I had my watch going and started to freak out when I was at 19 minutes and still hadn't hit the 5k marker. By the time I hit it, my watch said 21+ minutes and I was worried. I mean, I can almost run a 5k in 21 minutes! Maybe the course was miss-marked, maybe I really hadn't been pushing, I'll never know, but I was determined to finish my second loop in under an hour! That's when I really kicked it into high gear. I thought about how I wasn't just riding, I was supposed to be racing. So if a gear started to feel easy and rhythmic, I bumped it up or picked up my cadence. Turns out I was actually getting fatigued, because my first loop of the course was faster than my second loop, but my second loop felt better. Maybe it was slower because I was riding with no hands... we'll never know! I ended up finishing the second loop in 43 minutes on my watch, and was shocked when I found out in transition that I had done the whole bike portion in under an hour and a half. Not bad for a total of 4 training rides! My T2 went smoothly, just like T1, though I wish I had practiced dismounting, because I did feel a little sloppy and stuck getting off my bike. But after that I jogged it into transition, racked it, took off my helmet, grabbed my visor, race belt, gu, thought about grabbing a water bottle but decided against it, and walked while setting my nike+running app on my phone to the run start. Then it began. The run. The part of the race I was least worried about. I started running and my legs felt heavy and sore, but just in an uncomfortable way. But after about 2 minutes I started to feel dehydrated and overheat. I regretted my decision to leave my water on my bike. I was dying for the first of (thank god) 5 water stations over the 6.2 mile run course. But when I got to it, the worst thing happened... the water was HOT! I still drank it, but I then GULPED the cooler gatorade from the second table. 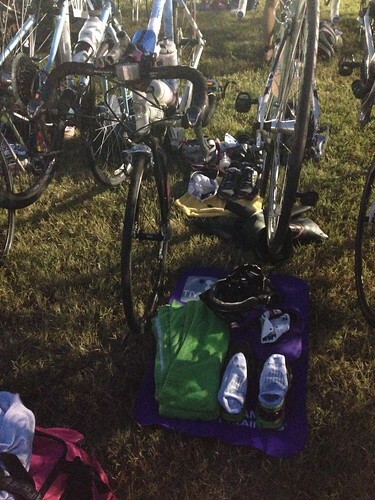 I knew I had made a horrible newbie triathlon mistake and had not hydrated enough before the swim and on the bike. I struggled through, not able to run for more than 40 seconds to a minute (though my run speed was okay) at a time, but the heat and dehydrated feeling was overwhelming. I knew that I would make it though, but I knew that my run would be over an hour, not the 56 minutes I had planned on (or the 51 minutes I am capable of). I accepted it and chugged along at a 10 min/mile pace. Even though the run wasn't going as planned, I worked through it and did the best I could. 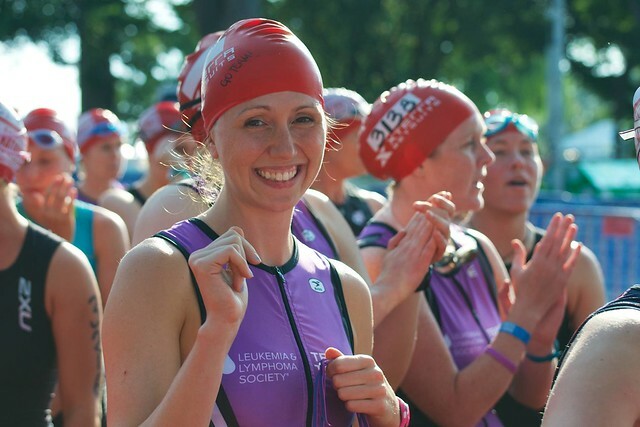 I was proud with every step, not just that I was competing in my first triathlon, but that I had done something completely new. I had raised money for an amazing charity. I went to trainings (not enough, but I am still giving myself credit for the ones I went to) where I didn't know anyone. 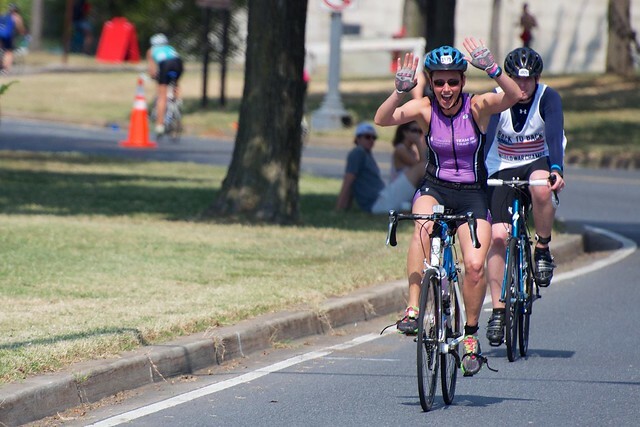 And mostly, I followed through on something I had wanted to do for three years, ever since my friend Josh did his first tri with TNT in 2011. See... I knew I had started about 2 hours after the stated start of the race, so I thought there was a chance that I had done the race in under 3 hours. Alas, my guesstamation was off and I ended up being 3:03:04. I am actually pretty happy that I didn't quite make my goal of under 3 hours, but I came really close, because it reminded me that you should have to work for your goals, not just show up. Sure, I'm still really proud of my time, and my place in my age group, I just know I can do better, and now I have the fire in my belly to prove it and actually train! 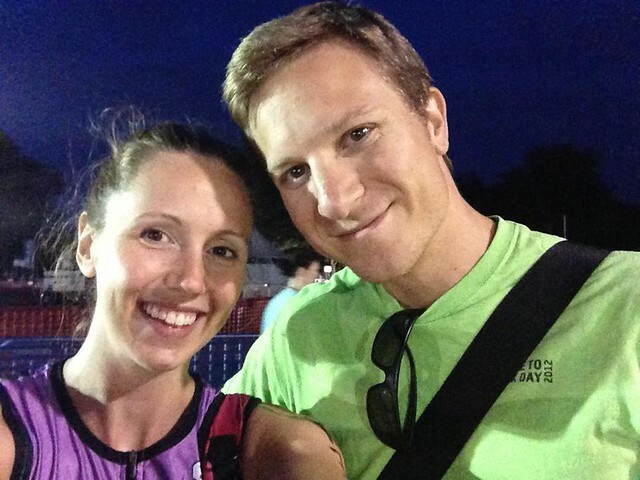 So that was my first triathlon. I hope you enjoyed reading about it as much as I enjoyed doing it! 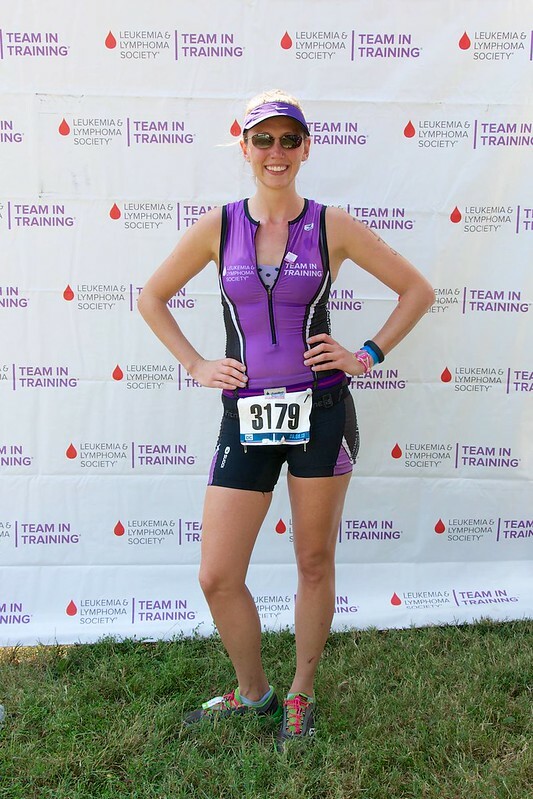 And check out my page for Team in Training for training updates, information, and if you'd like to donate!